The seventh generation BMW 5 Series claims to be significantly lighter, safer, quieter and more efficient than ever before. Plenty to worry rivals then. Jonathan Crouch takes a look at what's on offer. 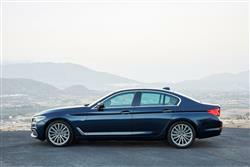 BMW's 5 Series is a full-sized Executive segment model that in recent generations hasn't quite been able to achieve the required blend between luxury and driving involvement. This seventh generation version claims a much better balance between these two extremes and adds in smarter looks, impressive media connectivity and a suite of electronic driving aids able to match the best that competitors have to offer. 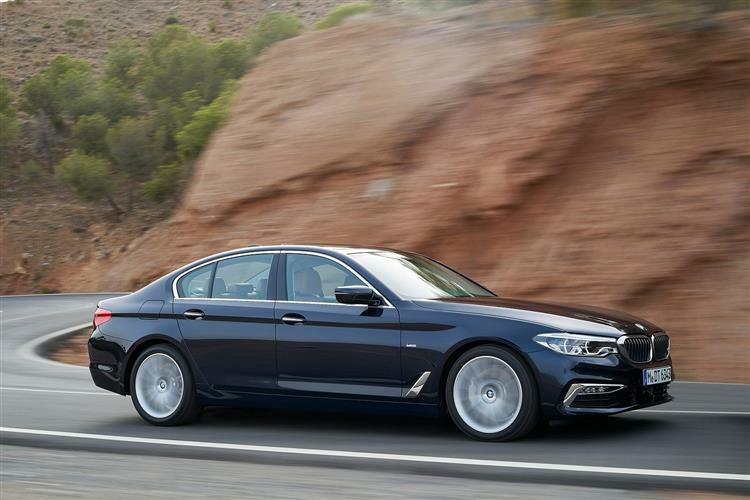 For well over four decades now, the question facing customers in the segment for full-sized executive cars has less been why they should choose a BMW 5 Series but why they shouldn't. This was the car that ruled its marketplace, the business buyer's 'ultimate driving machine' and the sixth generation 'F10' version ended up becoming the most successful model of its kind that BMW had ever made. It's dangerous to meddle with such an enduring success story, but the Bavarians have done just that by introducing the MK7 model we're going to look at here. A lot of the improvements made here you could perhaps have predicted. BMW's Plug-in hybrid tech makes an appearance and the sophisticated aluminium-rich chassis from the latest generation 7 Series also features beneath the skin. The company's expertise in autonomous driving systems and media connectivity is also showcased too. If all of this can shroud a car that cossets its passengers while still rewarding the driver at the wheel, then quite a contender is in prospect. The main news on the engine front concerns petrol power. The 184bhp 2.0-litre petrol turbo unit in the 520i will be popular, which slots into the range just below the 252bhp 2.0-litre four-cylinder powerplant used in the 530i. Alternatively, there's a 340bhp 540i variant which needs xDrive 4WD to control its prodigious 450Nm of torque. That's more grunt than older versions of the M5 super saloon used to have. BMW is of course planning another one of those for this model generation and this time round, this flagship variant will have over 600bhp. For more eco-minded folk, there's a 530e iPerformance Plug-in hybrid model that mates a four cylinder petrol engine with an electric motor to achieve a combined output of 252bhp. It can reach an all-electric top speed of 87mph. 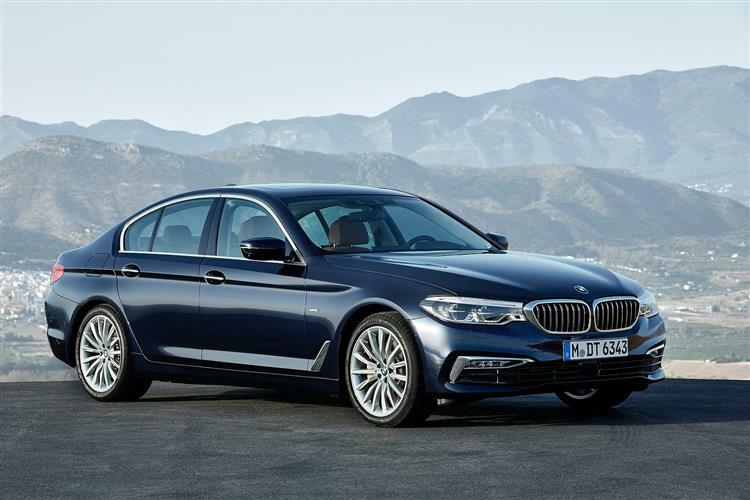 Most 5 Series buyers though, will continue to want a diesel, probably the familiar 2.0-litre four cylinder unit used in the 520d and the 525d, developing 190 or 231bhp respectively. All 5 Series models must use an 8-speed Steptronic auto gearbox. The alternative is the six cylinder 265bhp 530d which has 620Nm of pulling power. Both these variants are available with optional xDrive if you want it. For the first time, BMW xDrive can be combined with Integral Active Steering, as well as lowered sports suspension. As for handling, well a step forward was needed here with many commentators reckoning that the previous generation model was too comfort-orientated in its standard guises. This time round, BMW's engineers reckon they've achieved a much better balance of performance and luxury thanks to reductions in weight, revised steering and new double-wishbone kinematics in the front axle. 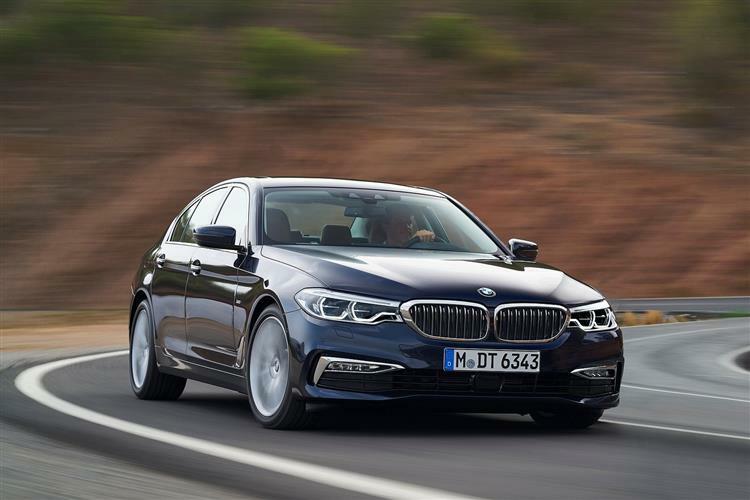 As before, 5 Series buyers get a choice of saloon and 'Touring' estate bodystyles, both of which offer exterior dimensions that are only slightly larger than those of the previous model. At the front, twin circular LED headlights flank the familiar BMW kidney grille. From the side, the passenger cell is clearly set back and a flowing roofline plus a short front overhang aim to underscore the car's sporting appearance. Underneath the skin, the same lightweight aluminium-rich 'CLAR' structure that was pioneered in the larger 7 Series model is much in evidence. Inside, as you might expect, much is borrowed from the latest generation 7 Series, including the optional gesture control system that works as part of the lowered instrument panel and freestanding display. There's more cabin space too, with more elbow and shoulder room, plus extra headroom in the rear and a larger 530-litre boot in the saloon that has a wider opening. Professional Navigation, telephone, entertainment features and vehicle functions can be visualised on the standard high-resolution 10.25-inch screen and controlled not just in the usual manner using the iDrive Controller, but also by means of gestures, voice commands or simply touching the buttons on the touch-sensitive display. There is room for up to three adults on the rear seats, which are also designed to allow room for up to three child seats. Prices start at around £36,000 for the model most UK buyers will choose, the 190bhp four cylinder 520d, a variant also on offer with xDrive 4WD. There's a big price jump of nearly £8,000 to go from this to the 265bhp six cylinder 530d derivative, also available with xDrive. For petrol people, the 252bhp 530i is priced from around £40,000, while the 340bhp 540i xDrive requires a budget of around £47,000. All models get Dakota leather trim, a high quality stereo and a Bluetooth telephone kit, plus Apple CarPlay integration. And, as you'd expect, there's a wide choice of options. There are sports seats (standard on M Sport models) and 'Comfort' seats that can be specified with a Massage function: in both cases, soft Nappa leather and decorative contrast stitching are optional. The extra cost Head-Up Display system will be popular too, now featuring a projection area that's around 70% larger than in the previous model. There are key changes this time round with Driver Assistance systems. Dynamic and Active Cruise Control systems take the effort out of motorway trips and there's an optional 'Driving Assistant Plus' safety package that not only keeps you in lane but also includes an 'Evasion Aid' that helps you to deal with any hazard that might suddenly appear at speed. 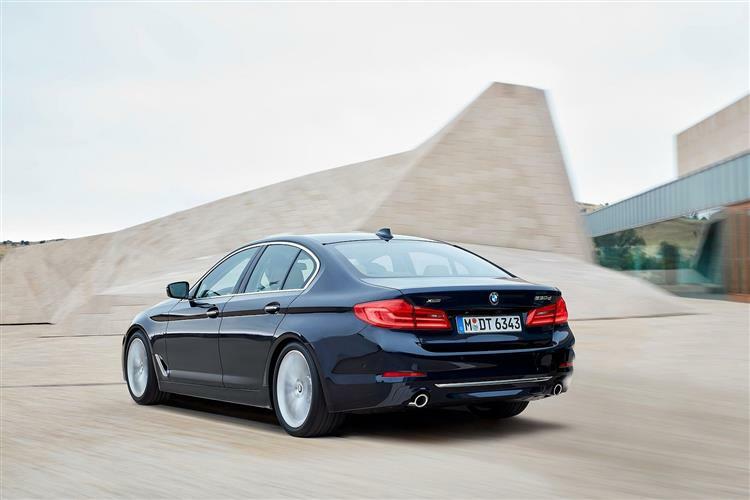 The four-cylinder diesel engine powering the BMW 520d manages 68.8mpg on the combined cycle, resulting in CO2 emissions of 108g/km - or 72.4mpg and 102g/km if you go for the eco-orientated 'SE EfficientDynamics' variant. Go for the six cylinder 530d and you can expect 60.1mpg, equating to CO2 emissions of 124g/km. Even the petrol units don't do too badly. 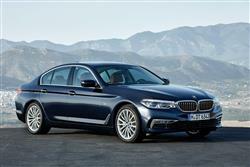 The potent 540i xDrive returns 39.2mpg with CO2 emissions of 164g/km - a reduction of 11% over the previous model. 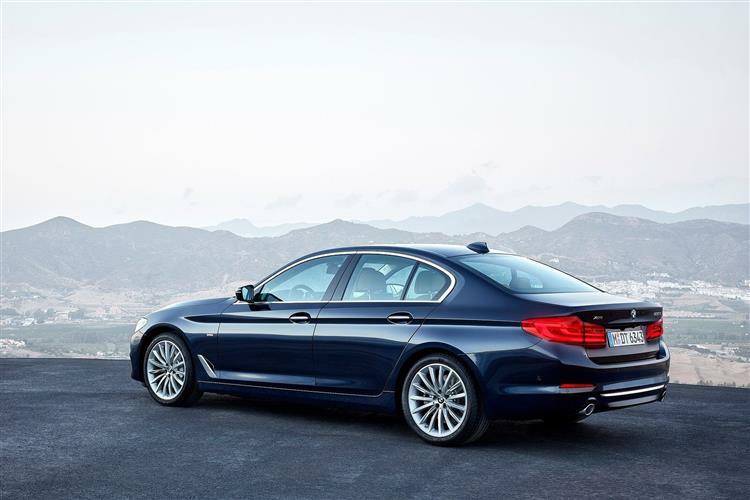 The most efficient variant in the 5 Series petrol range is the plug-in hybrid 530e iPerformance variant. Here, the BMW eDrive system and a four-cylinder petrol engine work together to achieve ultra-low CO2 emissions of just 49g/km, while fuel consumption is a remarkable 134.5mpg and the car has an electric range of up to 28 miles. The diesel exhaust systems operate using BMW BluePerformance technology, which combines close-coupled particulate filters and oxidation catalysts with a NOx storage catalyst. Exhaust gas after treatment in all diesel models is performed with the aid of SCR technology, including a water-cooled metering module for the AdBlue fluid, which serves to cut nitrogen oxide emissions still further. Plus the 'Drive Performance Control' system has an 'ECO Pro mode with Proactive Driving Assistant' option, which works with the 'Professional Navigation' system to detect braking situations in advance. Despite its enormous success over five decades and now seven different generations, BMW's 5 Series remains a car that's often underestimated. That's a little unfair for if properly specified, it can not only be the most efficient car in its class but also the best one to drive, a combination that takes some beating. Bear in mind also that to claim class leadership, it's not only got to manage that but also cover off the build integrity you'd expect in an Audi and the gadgetry and ride quality you'd want from a Mercedes-Benz. An enormous task. 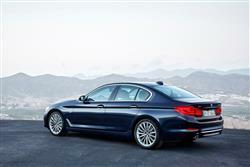 But not an impossible one, as this seventh generation 5 Series proves. True, it's a pity that to really create 'the ultimate driving machine', you've to spend so much on the options list. But even in standard guise, this is a hugely accomplished car, if one requiring familiarity and plenty of mileage over varying roads before its true qualities really begin to shine through. As before, it's quiet and roomy and now it's smarter, cleaner and even better on the balance sheet. A benchmark business BMW then. Just as a 5 Series has always been.